The world of economics is changing. Years of turmoil in the global economy mean that nothing will ever be quite the same again. 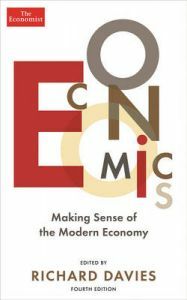 This is the starting point and theme of this radically revised Economist books classic. Richard Davies takes us on a journey through the paper's own analysis of the state of the world's economies, how we reached this point and what to expect in the next decade. He explores: * what's gone wrong since 2008, why it's happened and how we can stop it happening again * the shifting focus of economics from banking to labour economics * a new breed of firm with economics at their operational core * the future hopes and challenges for the world economy Along the way, we encounter the global economy laid bare, from banks, panics and crashes to innovative new policies to improve how markets function; from discussions around jobs, pay and inequality to the promise of innovation and productivity; and from the implications of emerging markets and the globalisation of trade through to the sharing economy and the economics of Google and eBay. The result is a fascinating review of the global economy and the changing role of economics in the new world order.